All transactions are safe and secure with a reliable history in online purchasing behind each of our associates. 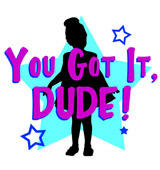 Buy the You Got It, Dude t-shirt to own Full House clothing and merchandise. You got it, dude! Yep, you got it, that is little Michelle Tanner's quote. The role was played by the Olsen twins, a dynamic duo who have gone on to become two of the world's youngest millionaires, running their own entertainment and fashion empires. Fans watched them grow from infancy into influential businesswomen out to take on the world. Celebrate their start with this Full House You Got It Dude t-shirt. In addition to the You Got It, Dude tee above, browse the Full House Clothing Gallery for more apparel like men's and women's clothes, kids shirts or hoodies.